A marketer’s job is far from straightforward. Within marketing teams, there can be multiple projects on-the-go at one time, making communication and campaign management an arduous affair. This is why collaboration tools can be a godsend, helping marketers to streamline workflows and enhance teamwork. Here are 10 tools that are worth using and why. 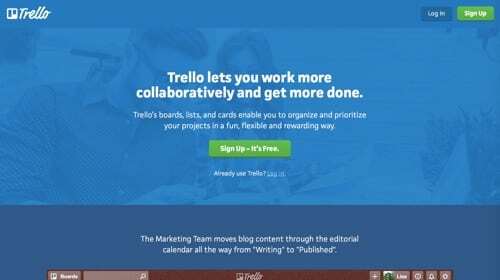 Trello is a project management tool that allows teams to organise work as well as brainstorm ideas. It is particularly helpful for content planning, as each new idea or piece of content has its own ‘card’, which can then be fleshed out with more information. People can be assigned to a card, for example, descriptions and due dates can also be added, and progress changed as you go (i.e. from ‘doing’ to ‘done’). It works well because it is highly visual and easy to get to grips with, allowing each person in a team to get an instant overview of who is working on what and when. Coggle can be an effective brainstorming tool for more complex projects. Instead of written lists, it is based on mind-maps and flow charts, allowing users to visualise processes and outcomes with colourful diagrams. Other users can be added to the maps to edit or add their own ideas. Coggle offers a free version with limited capabilities, as well as two further pricing plans with some or all advanced features. You can see an example of a mind map in the below tweet. CoSchedule is more of an over-arching management platform that allows teams to create a centralised view of marketing projects. This means that from email campaigns to social promotion – all aspects of marketing can be organised and monitored. There’s also a team management element, too, with performance reports giving an overview of each person’s performance and goals. CoSchedule also includes a social automation tool that can share posts at the optimum frequency. The tool has a 14-day free trial, and paid tiers starting from $80 a month. Slack is now one of the most widely-used communication platforms in the workplace, and there is good reason for its success. An alternative to convoluted email chains, it allows users to centralise conversations and share files. A chatroom structure means you can private chat with anyone, as well as create channels for specific topics. Another big benefit of Slack is its third-part integrations, which now includes over 1,500 apps including Dropbox and Salesforce. Slack offers a freemium version, as well as standard and plus tiers starting at £5.25 per active user a month. An alternative that’s very similar to Slack, Microsoft Teams shares the same conversational and content sharing capabilities. While Teams has less app integration overall, one clear benefit is that it can integrate with Office 365 and other Microsoft apps such as Skype. It also now offers a freemium version, alongside paid tiers starting at $5 per month. Yammer, also from Microsoft, is an enterprise social network that encourages teamwork. A sort of ‘Facebook for work’, it allows users to chat, share content, and interact in groups. In this sense, it is less of a productivity-driven tool, and more geared around HR-focused activities and general fun. That being said, it does have many of the same features as other collaborative chat platforms, so could easily be a good option for Office 365 users. GoToMeeting is an online video conferencing solution, allowing teams to set up and attend meetings regardless of where they are. The aim is to simplify the entire meeting process, so handy features include: the ability to set up one link and personalised URL, to participate in meetings via the mobile app, integration with Outlook, and HD video. GoToMeeting starts at £12 per month, rising to £19 for pro features such as drawing tools and unlimited recording. Join.me is an alternative video conferencing platform to GoToMeeting, also offering a similar range of features including screen sharing and one-click scheduling. Its whiteboarding feature is particularly good, building on the idea that adding a visual element to meetings can aid productivity and interaction. This feature allows users to draw and illustrate ideas using the Join.me app. Join.me starts at £9 per month, rising to £13 and £20 for pro and businesses tiers respectively. Etherpad is an Open Source online editor that allows users to edit documents in real time. It is similar to Google Docs, however, certain features separate it, such as the ability to colour-code changes made by different authors. These changes can also be recorded and reviewed over time, before the final version is created. Etherpad is a free tool, which is another benefit, especially for small teams or companies. Canto is a digital asset management software, allowing marketing teams to share, organise and access images, videos, and other brand assets. It creates a centralised library based on tags, which makes it easy for teams to find what they’re looking for quickly. Other features include the ability to set up a style guide to ensure unity across the business (informing teams of colours, typography, and key brand messages). You’ll need to contact Canto to receive a pricing quote.